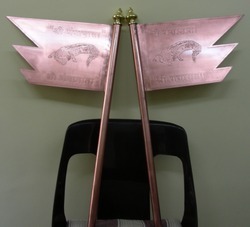 We are Offering you a complete choice of products which include Copper Products such as Copper Vastu Yantra on sheet metal in 2 D and Copper Connector Lugs as displayed. Our clients can avail the offered products from us at the most reasonable price range. 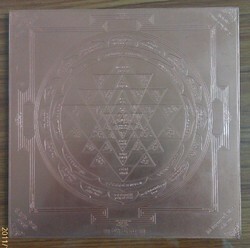 We offer Copper Vastu Shriyantra to our clients. This copper vastru yantra blesses the owner with wealth & prosperity and opens avenues for new sources of income; increases fund flow & encourages accumulation of wealth. 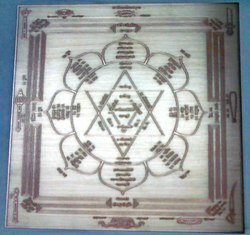 We have done Shree Yantra of size 4 Ft X 4 Ft.
We give services of Etching on Copper plates of thick material supplied by party. 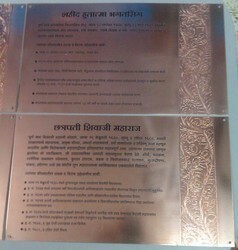 We give services of Etching on Panchadhaatu Sheet supplied by customers as it is required for Poojan. Panchadhaatu Yantras are suppoosed to be used for sacred holy Poojan. These sheet has to be casted & made in sheet form by party. 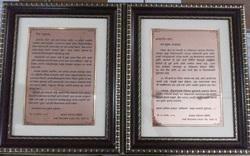 Momentos etched on Copper Sheet of 20 swg & Then framed as per sample displayed. This is as per customer's specific requirement and size. Max size can be done is 13" x 47". We manufacture name plates labels required for fashion industry, leather bags, mangal toran in copper in 24 to 16 swg as per individual, company requirements.